REPORTED IN 196,5. AND LESS THAD I MILLIfON POUNDS IN 1956 AND 19S7. LARGER THAN STOCKS A VEAR EARLIER. St (n- z Io a.
smallest in the last 6 years of record. substantially in the late spring and summer. year was 3 percent smaller than in the same months last year. >rools into the 1940-4l season in those countries will be small. whole, than in March, according to the Agricultural Marketting SErvice. earlier at 64 cents a pound. of cny recent :y,'r, .xcernt 1937, then 76 million pounds were innrrted. and the 5-year (1934-38) average for those months of 31 million pounds. smallest 'March 30 stocks in the 6 years of record. 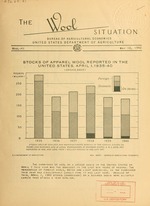 but were smaller than stocks of foreign wool roport,.d on April 1, 1937. 1/ Apopro-ximate. Reporting dates vary slightly from year to year. 2/ Not including any wool of tho new clip. 31 Ibt reported. Mny be smaller than in the last half of 1939.
imports are expected to decrease substantially in the late spring and summer. large, and imports may again increase in the fall ond winter of 19140-41.
weakening influence on domestic prices in the next few months. countries under present conditions of incroised military activity. exportable surplus in Argentina had been sold by the end of February. the largest for those months since the 1930-31 season. season in the 5 years 1934-38.
exports for those months in the five seasons 1934-35 through 1938-39.
are.shown on ,pa te 14. _. 1. I i 1 i.il. .:. '-. l.lb. j Il. b.
Buenos Aires Branch, First lJatir.ial Bank of Boston. Prices of short v:ools advanced at South African sales in April. States have been small since February. L/ Inl.id~:-s auction and private sales and wool shipped unsold. of March were the smallest for that date in the last 10 years. March are shown on page 14.
b. Mil. lb. Mil. lb. Hil. lb. Mil. lb. 1b s ... !-il. 1b Mii. lb. SOffice of Foreign Agricultural Relations. - production for 1939-40 is 270 million pounds. S2 Auction and private sales and wool shipped unsold. / Greasy and scoured combined. disposed of through reporting brokers. at prevailing rates of c:.h n'e. and to neutral countries, the balance going direct to the Unitod Kingdom. to the United Kingdom and 150 million pounds to France. Reports-of the Agricultural Marketing Service except as otherwise noted. Foreign prices have been converted at prevailing rates of exchan-e.
..r Statistics. 5/ Domestic yarn, first quality, Bureau of Labor Statistics. .-:;r-g, no quotations, August through November. : Yer : Jan.-Mai. : lar. i Feb. a Mar. : b. lb. l 1 -. lb. -b. lb. / Weight of greasy, scoured, and skin wool added together. F/ Fires for FT'bnrary ond March based on 4 vwel:s, J .nrr:y-Larch on 13 weeks. 135-3 ficurcs for 53 weeks ended December 31. No adjuct-melrtr made for holidays. received from pulleries and is mi)tly washed. 2/ If any, included with "other." V Preli..inary. ,/ Argentine figures include small quantities shipped to Canada. SIf any, included with "other."